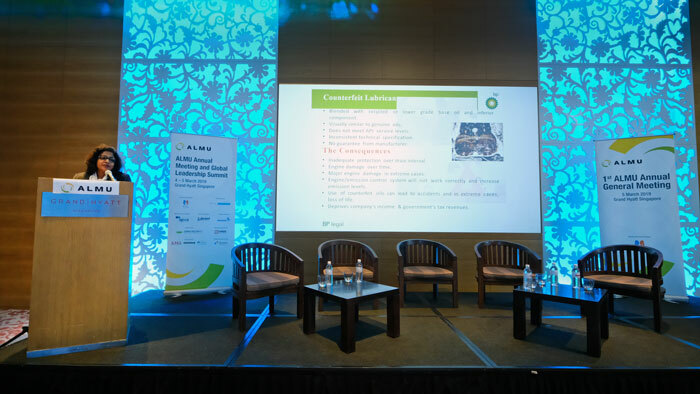 “Counterfeit oil won’t disappear anytime soon,” says BP’s Sharmini Lohadhasan, Counsel – Brands, while speaking at the ALMU Annual Meeting & Global Leadership Summit on March 5, 2019. During her presentation, entitled “Current Trends and Challenges: Counterfeit Oils,” Lohadhasan highlighted a need to work more closely with customs officials to reduce the flow of counterfeit products that are now crossing Asia’s borders. A growing trend of exporting genuine goods has offered additional opportunities to parallel import counterfeit products, says the BP representative. Traditionally, companies have worked closely with police on enforcement. Now we need to shift more focus to border control, says Lohadhasan. A shift in lubricant demand from Europe and North America to Asia; online sales of lubricants; sales of lubricants through social media platforms such as Facebook and WeChat; and easy access to technology, are also compounding what is a substantial issue. Coupled with this, counterfeiters have been generating high margins “comfortably in the range of 100-200%,” says Lohadhasan. The value of some counterfeiting programs is astonishing, Lohadhasan citing one example of a USD 40 million operation uncovered recently in China. In terms of administration, resources allocated to law enforcement are limited, with enforcement of Intellectual Property rights dropping in priority in some jurisdictions. Also, gathering of evidence is “not as easy as you think” due to a lack of awareness amongst authorities, consumers and ecommerce platforms, confirms Lohadhasan. However, BP believe there is an opportunity to utilise technology to enable better collaboration between government agencies, brand owners and different supply chains, and to work more closely with ecommerce platforms moving forward.